Got Wanzhen to send me a close up pic of the star as I forgot to take picture of it..
Peipei and Benny dropped by just now and went off with pretty lacey nails! 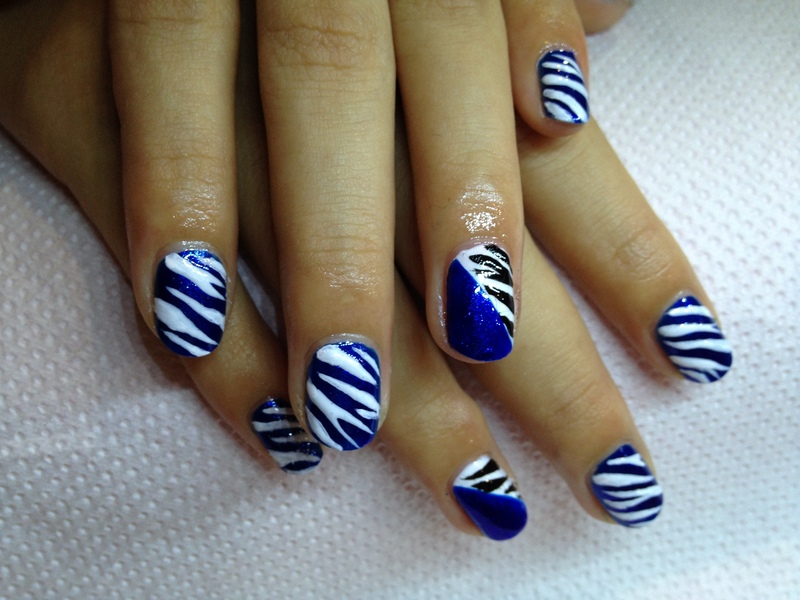 This design works best with her type of nails, long and big nail bed, very pretty! 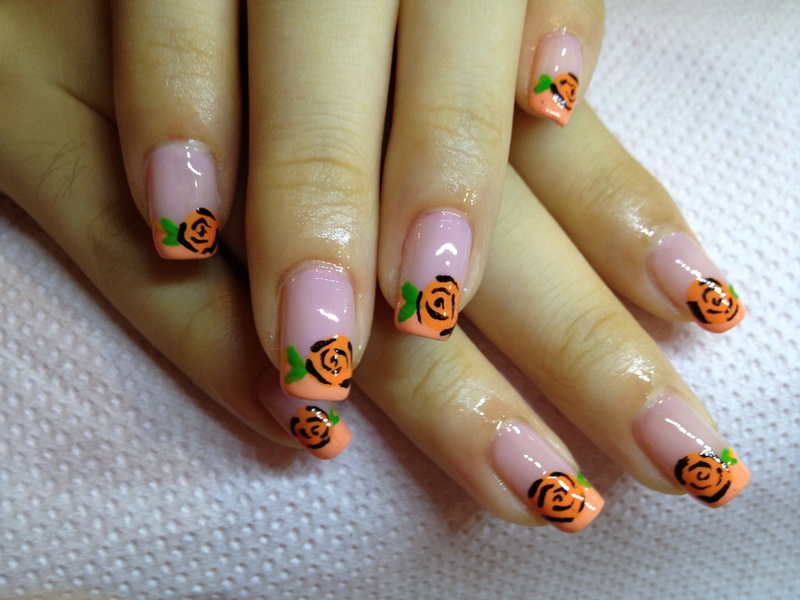 I did this same lacey design on another customer before her with this on her thumb and pink and grey nails on her alternate fingers, but I was too absent-minded I forgot to take picture of it..
My favourite design of the day – orange rose on french! Had this design for quite some time but no one tried it yet, today was my first attempt and I’m surprised that it actually turned out to be so good! I was so upset with the result that I wanted to re-do another set for her but I didn’t had enough time cos’ I still had a long Q behind her so I charged her $2 lesser.. 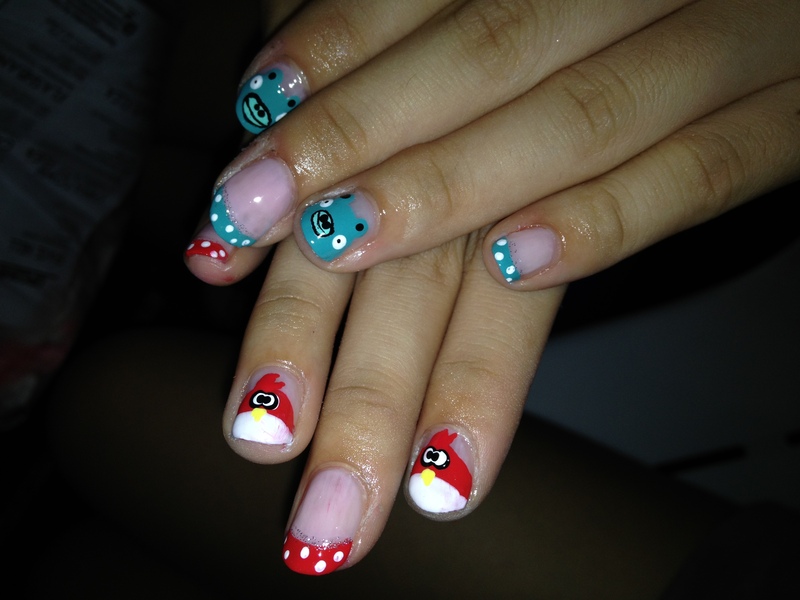 Angry bird & pigs set again! 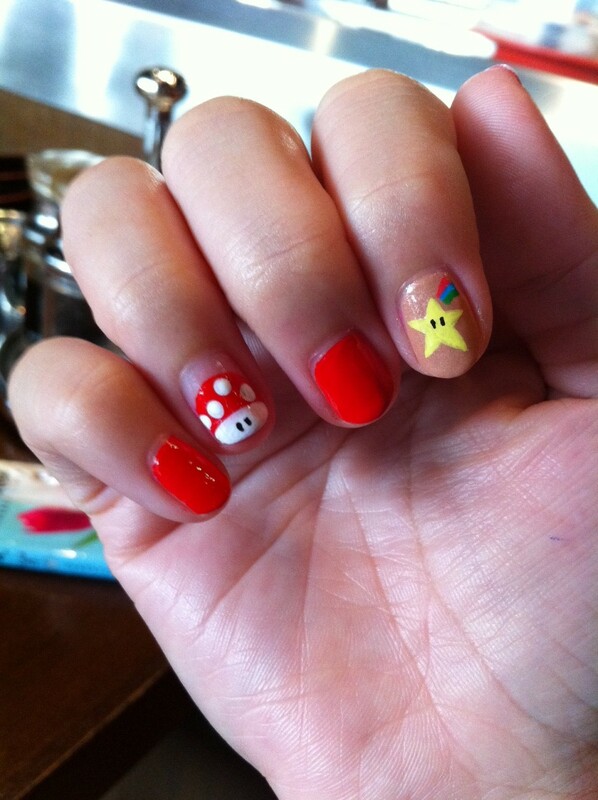 I think I was quite affected by the result of Zoey’s nails so this was badly done again.. So, I charge her $3 lesser too. 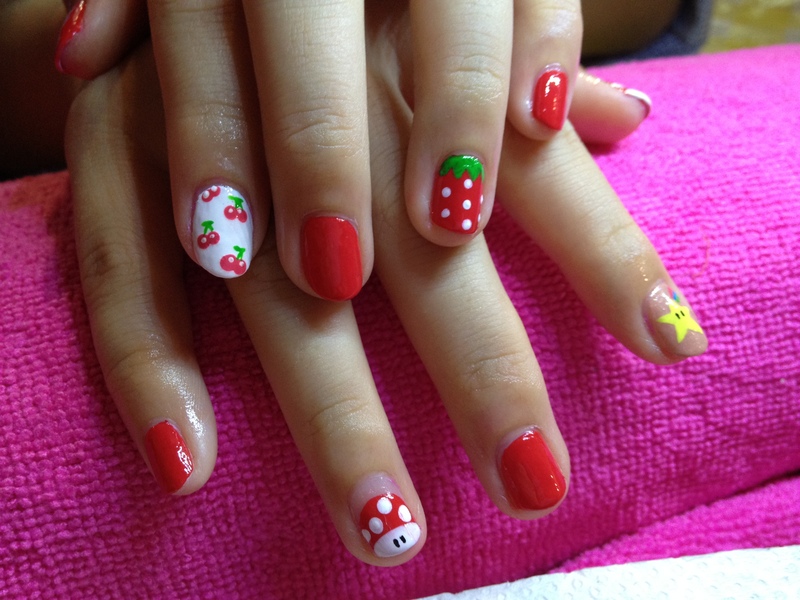 I do not charge customers full amount if the result isn’t up to my expectation, the main purpose of me offering affordable manicure services is not to earn money for now but to practice as much as possible. Looking at the picture here, I realized I forgot to add in brows for the animals oh gosh! I realized I start to charge customers lesser and lesser as the day goes by lol, maybe I was overcome by fatigue of doing so many sets continuously. Did the wrong design for this customer, she wanted half moon tips curving up but I did french tips for her….. ): Don’t know what happened to me today made so many mistakes sigh. 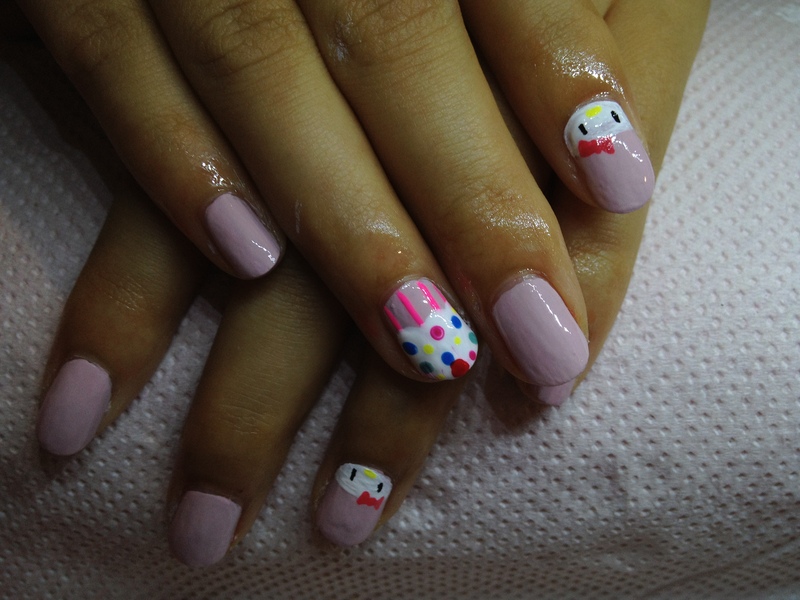 Hello kitty and cupcake nails facing up. I seldom do it this way as I like it the other way round, but there are customers who prefer it facing up! Gotta make it a habit to ask their preference before I start to prevent myself from re-doing, hehe. 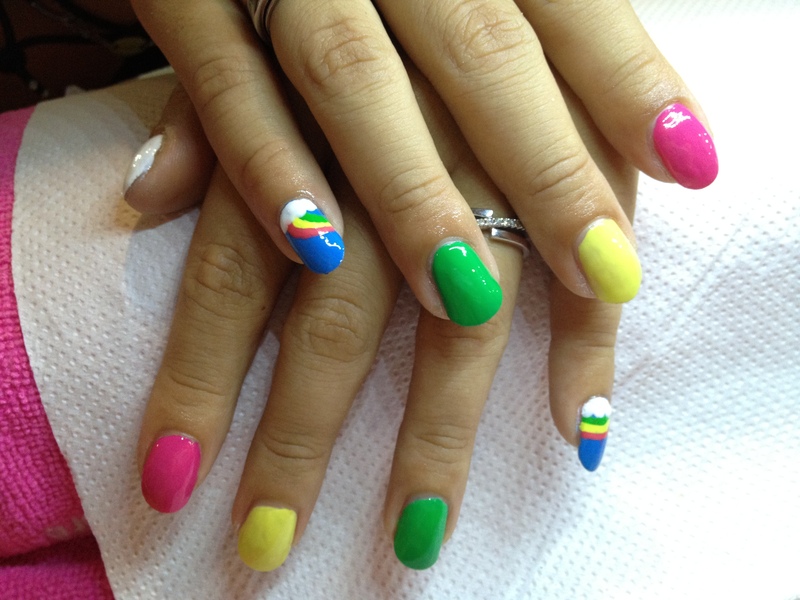 This customer request for rainbow nails on her pinky and the same colour on the rest of the nails, very creative! Notice the rainbow is also facing upwards?